You are here: Home > Guy Davis & Fabrizio Poggi Score 2018 Grammy Nomination! Northport NY – M.C. Records is thrilled to announce that Sonny & Brownie’s Last Train by the Ambassador of the Blues, Guy Davis and international harmonica sensation Fabrizio Poggi has been nominated for a Grammy Award in the category of Traditional Blues. This marks the first Grammy nomination in the 30 + year career for Guy Davis and also for Fabrizio Poggi. It is the sixth Grammy Award nomination for M.C. Records and our first since 2007. The award ceremony will take place in Guy’s hometown of N.Y.C. on January 28 at Madison Square Garden. Here’s what Guy had to say when he found out about the nomination, Wow! Grammy nominated! Ain’t that crazy? Fabrizio and I are jumping up and down. You’ll be doing yourself a disservice by not immediately purchaing this first-rate record. 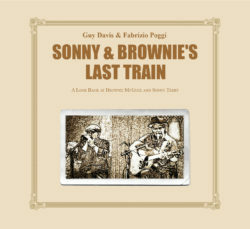 Check out Guy Davis & Fabrizio Poggi performing songs from Sonny & Brownie’s Last Train on Folk Alley.